I am truly grateful to you for choosing DirJournal for your Directory & Local listings over the years. I’m elated to let you know that on 20th May 2017, DirJournal will be 10 years old, this could not have been possible without you. I cannot thank you enough for all the support and trust you put on us. It has been an honor for the last ten years to serve our customers, and we have a token of appreciation to customers like you – a huge giveaway awaits you! You can NOW grab your directory listings at a whopping 40% discount using coupon DJTurns10 and get the rare chance to win an iPhone 7 Plus 32GB, Free listings and more prizes – this is a thank you gesture to our customers. Our 10th-anniversary giveaway is now live! 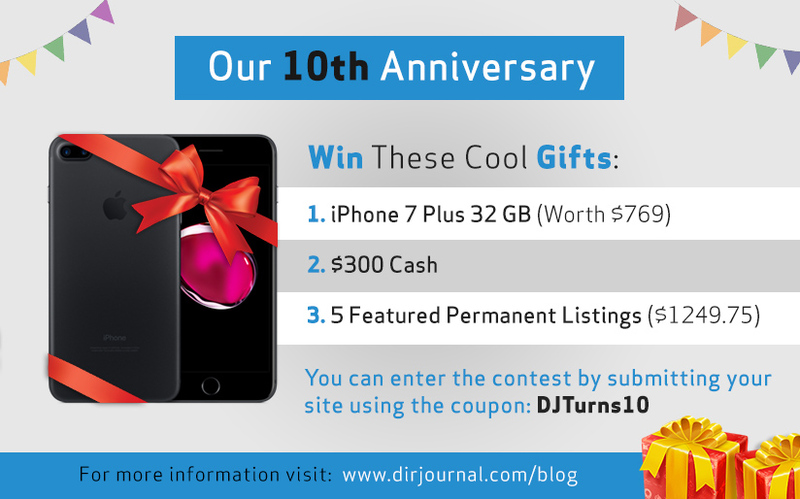 We are delighted to invite you to participate in this giveaway contest and also give you an only chance to get listings at 40% discounted prices using coupon: DJTurns10– this offer is valid for only a few days! All the prices will be going up after this offer period expires – DO NOT MISS THIS CHANCE. ** iPhone 7 Plus 32GB – worth $769. ** Cash Prize of $300. Once this offer expires, it will be gone forever! Don’t blame me WHEN IT’S GONE; you need to take action now! Purchase any listing during the giveaway period – 15th to 29th May. We have a great discount running to help you enter the giveaway. No matter where you’re now, this is a deal of a lifetime – you need to ACT NOW! Once again, thank you so much for choosing DirJournal and let me know if there is anything I can do to assist you further. * Cash value prizes require a PayPal account in order for the winners to claim their prize. If the grand prize winner doesn’t want the iPhone for any reason, they can also request a cash value prize (but they must also have a PayPal account). The cash value for the iPhone prize will be considered $769. On May 30th, 2017, we’ll choose 7 winners at random from all qualifying submissions. To keep things fair, we’ll run all eligible entries through Random.org. To avoid any bias, no one will manually choose the winners. Winners will be announced on June 2nd 2017 on Twitter, and winners will be contacted via Email for more information about collecting their prizes.